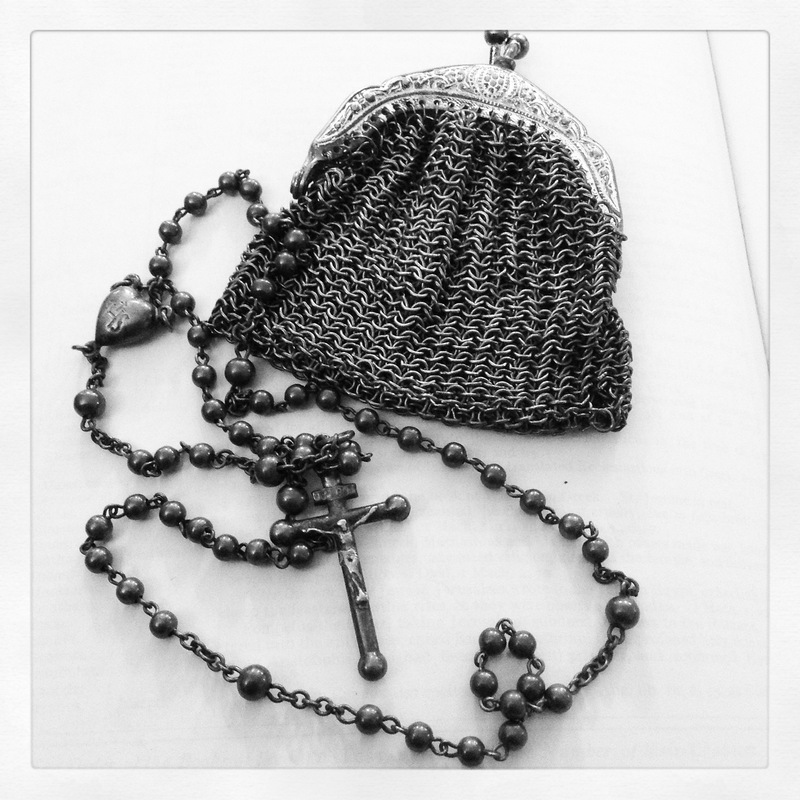 When my cousin brought out this rosary, I knew immediately to whom it had belonged. I recall her holding the silver beads in her hands while praying. I remember as well running the beads through my fingers, admiring the workmanship. Often as children we would admire the small silver purse that the rosary was kept in, exclaiming in delight at the small chain links. When I look at my grandmother’s rosary I see not only the craftmanship of years gone by, but I also see her face. I recall her voice and her smile. I think of the moments we spent together when she came to stay with us. It is memories such as these that keep her close to me in my heart. What things remind you of loved ones that are no longer with you? It is amazing how personal little keepsakes can call a spirit forth. I think that is why we like to keep a little memento of the people we love. This reminds me of an assignment I had for a photography class. We had to capture a person, through his or her belongings and the person couldn’t be in the photo. I took photos of my sister’s toys. She’s still around, but she’s no longer a toddler. That sounds like a fun assignment and something I could consider doing on other people in my life. This is beautiful, Colline and touching. I don’t have things to remember them by any more, but memories do not fade. They certainly do not – and the memories are with you wherever you go. That’s really lovely, Colline, and what precious memories it brings back for you. I have a Chinese jade and gold pendant which belonged to my Gran. My mom used to wear it all the time after her mom died, but now she’s in a care home and having jewellery there is not advisable, so she gave it to me. I’ve always admired it and will treasure it. The things that are passed from mother to daughter are always special. I have a rosary too Colline 🙂 It belonged to my Mother and is kept in a little special box . That’s a lovely photo memento you have now as well ! Those hold precious memories too I am sure. Thank you. It looks delicate and yet when you move it through your fingers you can feel its strength. I agree – especially for the memories it evokes. How priceless. I love it when little things remind me of a loved one and all the happy memories and feelings associated with the person. And it was so unexpected too as I had no idea that my cousin had my grandmother’s rosary. Glad you enjoyed looking at this Nia. I find it beautiful too. So glad I spotted this, Colline. I glimpsed it on Paula’s Thursday’s Special but didn’t visit for a proper look. I commented to Paula how beautiful it is though 🙂 Glad I’ve now read the story behind it. Thank you Jo. I find it beautiful too especially as we no longer see this type of workmanship. I have the rosary my mother had as a child. I had no idea that she had one until she died and we were going through her things. She was raised Catholic but converted to Episcopalian when she married my father. What a lovely way to remember your gran. My gran used to be very good at Scrabble. I still have the notebook we used to ‘keep score’ with her characteristic scratchy writing where she kept score, and my childish font where it was my turn! She was a very strict player! That is a beautiful memory Madoqua. How nice that she gave you a turn to keep score. It is not a sight we see nowadays John. It is definitely a habit that is not easily noticed these days.